Implementation of DEvelopmentAl Learning - Free Massive Open Online Course - from October 13th to December 7th 2014. The IDEAL MOOC is over but you can still use it as a "permamooc". You can follow the lessons at your own pace and engage with the community by posting comments and new posts in our dedicated Google+ community. To be notified of possible future sessions, please register to the MOOC platform or to the G+ community. The IDEAL MOOC will teach you the cognitive science background and the programming bases to design robots and virtual agents capable of autonomous cognitive development driven by their intrinsic motivation. More than that, it will offer a place to discuss research in Developmental AI. Curious persons who wish to discover the current state of the art of Developmental AI and understand its underlying concepts. Developers and roboticists who wish to program their own developmental robot or virtual agent. Scientists in computer science and cognitive science who wish to contribute to the Developmental AI research agenda. The IDEAL MOOC is designed to satisfy these three types of participants. Our goal is to spread the current state of the art while promoting research in Developmental AI. Programming activities will be optional. Developers will be provided with example code in Java but they may do the programming activities in their preferred language. The first edition will start in October 2014. It will last six weeks and require approximately two hours of individual work per week, not including optional programming activities. Certificates of achievement will be delivered. Developmental AI is a new branch of AI that aims to program a minimal initial system able to develop its intelligence by itself. If implemented in a robot, it will initially behave like a newborn baby, then it will become increasingly intelligent as it interacts with the world. By grounding the system's knowledge in the system's individual experience, developmental AI addresses fundamental questions of cognition such as autonomous sense-making, individual choices, creativity, and free will. 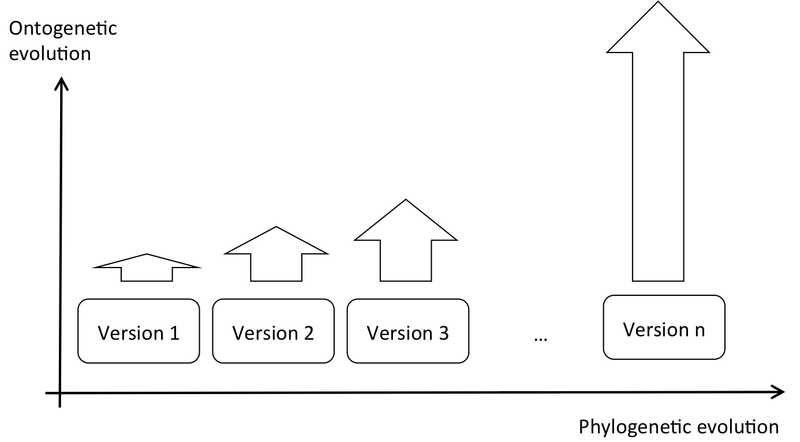 The MOOC will follow a progressive pathway, similar to the research pathway, consisting of implementing successive versions of agents, starting with very simple versions, as shown in Figure 1. Figure 1: Progressive organization of the IDEAL MOOC. Horizontal axis: successive versions of the developmental-learning algorithm. Vertical axis: level of development that each version can reach when it is executed. Each version is pre-programmed, but, when executed in an environment, it continues developing by learning new executable code up to a certain point (vertical arrows). Researchers seek to progressively understand what mechanisms should be pre-programmed to reach increasingly higher levels of cognitive development, with the perspective, on the very long term, to design a version capable of reaching a level of intelligence comparable to human's. The originality of developmental learning algorithms is to learn executable code. This differentiates them radically form traditional machine learning algorithms—such as neural networks and reinforcement learning algorithms—which learn values and weights. Video 2 illustrates the learning of rudimentary re-executable code. Video 2: Example of self-programming. These two agents implement the same initial algorithm. Yet, because they go through different individual experiences, they find different strategies to catch a prey. Notably, some genetic algorithms also learn executable code. However, genetic learning occurs from one generation of agents to the next (horizontal axis in Figure 1), whereas developmental learning occurs during a single agent's lifetime (vertical arrows in Figure 1). In contrast with traditional AI, Developmental AI does not aim at solving pre-formalized problems. Therefore, we do not evaluate developmental agents through their performance in reaching a predefined goal. Instead, we analyze their activity using activity traces, to demonstrate the emergence of cognitive behaviors. Video 3 shows the activity trace generated by a developmental e-puck robot. Video 3: Activity analysis of a developmental e-puck robot. Learning to what end? This is the problem of the agent's intrinsic motivation. What programming language and what execution engine for the learned code? This is the problem of the agent's cognitive architecture. How to measure and assess cognitive development? This relates to the problem of defining and measuring intelligence. The IDEAL MOOC will teach you the necessary background in cognitive science to answer these questions, specifically, by referring to constructivist epistemology, theory of embodied cognition, theory of enaction, and biologically inspired cognitive architectures. You will be offered different activities in order to analyze and reflect upon these theories, individually or collaboratively. Optional programming activities will also teach you to design virtual agents and robots such as the sharks and the robot shown in Video 4. Video 4: Developmental virtual agents. The two gray sharks generate natural learning behaviors such as playing together and exploring a dynamic and imprecise environment, without ontological assumptions about the objects that they may encounter. See the syllabus, the lessons, and the discussions in the Developmental AI MOOC Google+ community. If you have troubles using the interface, please watch this video: How to use the IDEAL MOOC. Meet the participants and stay updated by joining the Developmental AI MOOC Google+ community. Please share the information in your favorite social media. Our hashtag is #IDEALMOOC. Olivier Georgeon, Alain Mille, Amélie Cordier, Aurélie Kong Win Chang, Joseph Garnier, Simon Gay, Amel Corny, Cécile Barbier-Gondras., Jonathan Morgan. The IDEAL MOOC has its origins in the Silex group's work on dynamic knowledge construction, and in Olivier's course on developmental learning. The IDEAL MOOC received support from the LIRIS Laboratory, the Université Claude Bernard Lyon 1 (UCBL), the Connaissances Ouvertes A Tous (COAT) program of the CNRS, and the French Agence Nationale de la Recherche contract ANR-10-RPDOC-007-01. The IDEAL MOOC is published under the Creative Common license CC-BY-NC-SA. Back to the IDEAL Project Home Page. Last updated December 7th 2014.